One of the good things about Ireland, I have often thought, is the lack of emotional distance between people: the fact that we (generally speaking) tend to see everyone we encounter as a potential friend, and are prepared to help when we can, or at least to interact and be friendly. The lack of reserve, of formality, of self-importance. Of course there can be a downside to national qualities like these, but it certainly doesn’t outweigh the upside in this case. I think this photo, from thejournal.ie, captures the lack of emotional distance well. It shows the rugby player Jamie Heaslip at Dublin Airport yesterday, as part of the homecoming of Ireland’s victorious Six Nations squad, and a young fan. 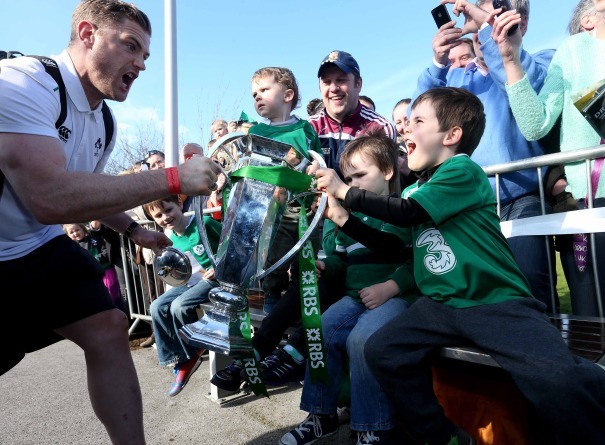 Heaslip is clowning around and pretending to be trying to wrestle the trophy from the boy, who surely will always remember the moment. Heaslip is happily giving something that he doesn’t need to give. This generosity of spirit – also shown by the other players, who mingled freely with fans and posed in numerous ‘selfies’ – is something we should be thankful for. In the words of an old beer commercial, ‘it’s part of what we are’. It connects us and makes us stronger: we may not have much, but we know what we have. Itâs good to see you still working the Blog. I enjoyed reading it and agree with the spirit of the words. We are in a different situation, sad to say, but some of us still manage. Thanks for taking an interest, Ike. I have been neglecting this blog, really … busy with other things. I’m glad that some people like to read what I write.